If football is all about chasing another chance in a new place, Jeshrun Antwi was ready for the game before he ever set foot on the field. Before moving to Canada in 2010, the Calgary Dinos running back had already lived in Israel and Ghana. The trip wasn’t over arriving in Canada, as Antwi would move between Calgary, Toronto, and Montreal multiple times over. Having moved around so much, Antwi never felt settled in to life anywhere in Canada until his return to Calgary to start high school. A constant for Antwi was athletics, something in which he excelled. A multi-sport athlete, he would pursue any sport that would give him a passion to pursue after a day of class. Eventually, the desire to play all sports would clash and limit the young athlete. With the avid volleyball and basketball player finding his sports seasons overlapping, a chance observation would set his athletic career. While holding a natural inclination for the game of football, Antwi still needed coaching in the classroom. He caught the attention of his high school principal, Katherine Miller, and soon they would become major factors in each other’s lives as Antwi once again found a new home. They took me into their home and helped me become a student. Today, I call them my Canadian parents, because they’re pretty much my parents…Words cannot describe how huge they have been in my life. 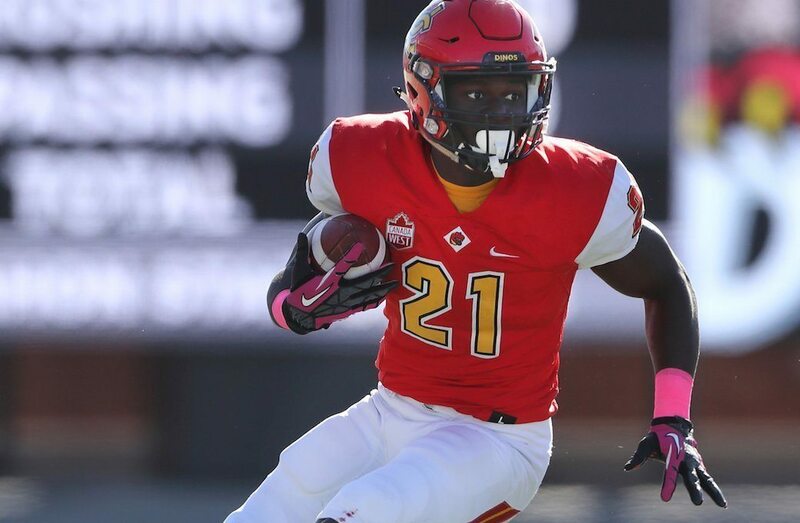 From high school to the University of Calgary, the lessons instilled in Antwi from his Canadian parents have led to great success on and off the field. 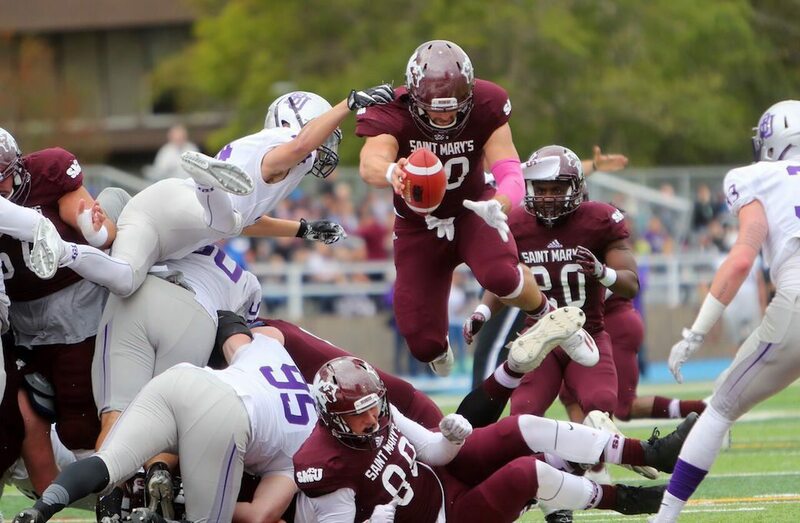 Despite an injury-shortened rookie season in U SPORTS, his performance on the gridiron and in the classroom still lead him Academic All-Canadian honours, proving that he had found his place in football as a player and as a student. 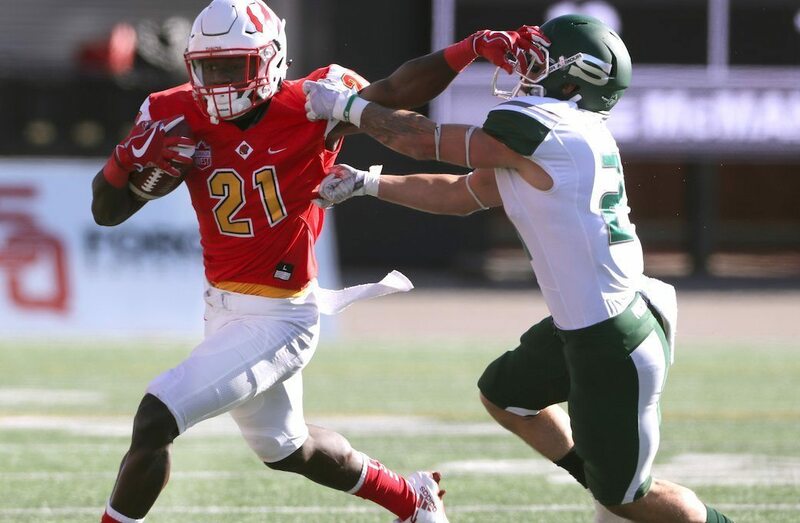 Antwi really came into his own as a dominating figure in U SPORTS on its biggest football stage, the 52nd ArcelorMittal Dofasco Vanier Cup. In his second year as a player, he ran for 177 yards against the Laval Rouge et Or, who were seen as virtually unbeatable. While the Dinos may have lost the 2016 Vanier Cup 31-26, the real run for the title was only just beginning in Calgary. The Dinos have come back in 2017 with a vengeance, so far boasting an undefeated record in six games. 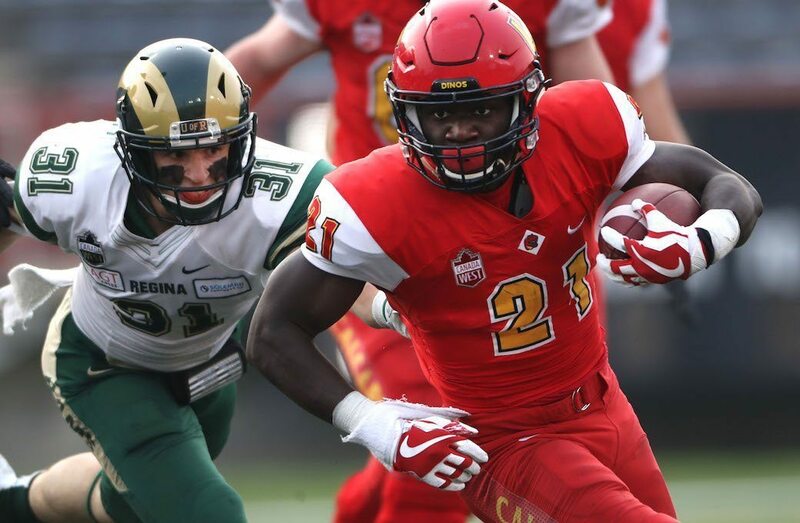 Antwi has proven to be a key component of this streak, with the now third-year recording 357 rushing yards and two touchdowns as the Dinos take Canada West by storm. While the 53rd ArcelorMittal Dofasco Vanier Cup in Hamilton, Ont. still seems lightyears away in football terms, Antwi knows where his team’s sights are set. “I think every team in U SPORTS, if you’re not playing to go to Hamilton, then you’re in the wrong sport,” Antwi says. “We went all the way and then we lost." We don’t pride ourselves on looking too far ahead, but I think that deep down inside, every single one of us knows that in order to get back there we need to take it one game at a time, one play at a time. After a lifetime of relocation, Antwi has finally settled in to his new home, family, and passion through football. However, despite finally being able to call Calgary his home, there is nothing he would like more than one more trip to Hamilton. VANIER CUP FACT: The winningest coach in Vanier Cup history is Glen Constantin, who has a record of 8-1 with the Laval Rouge et Or. The second winningest coach was Calgary’s Peter Connellan with a record of 4-1. Two coaches are tied with three wins apiece: Saskatchewan’s Brian Towriss (3-6) and Blake Nill (3-5), who is the only coach to have led three teams (St. Mary’s, Calgary, and UBC) to the Vanier Cup. 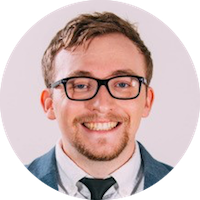 Christian is a third-year sport media student at Ryerson University. He previously obtained a Bachelor’s degree in English at Acadia University, where he provided colour commentary for the Acadia Axemen and Axewomen soccer teams. His reporting repertoire includes U SPORTS, the Canadian Women's Hockey League, and the Verizon IndyCar Series for Honda Indy Toronto.